Episkopi Gonia can be found at the foothills of Profitis Ilias Mountain on the way to Kamari, 6 kilometers from Fira in the south eastern region of Santorini. The village is called known as Mesa Gonia, since that was its official name until 1915. Mesa Gonia used to be in important area for producing wines. On old maps it is also referred to as 'Kato Gonia' (Kato Gonia = The Corner Below). Episkopi Gonia received its name due to the proximity of the Byzantine church Koimisis of Theotokou, also known as Panagia Episkopi. 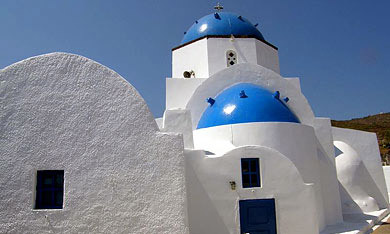 History records that the church was the headquarters of both the orthodox and later the Latin bishop on the island. Episkopi Gonia was almost completely destroyed during the earthquake of 1956, and most of the inhabitants moved to Kamari. Agios Georgios village owes its name to the church of Agios Georgios Thalassinou = Saint George of the Sea, otherwise known as Thalassiti = Mariner, which was built over the foundations of large basilica. The village belongs to the community of Emporio, 14 kilometers from Fira on the south east coast of Santorini near to Perivolos. Well known is the beach of Perivolos - Agios Georgios. 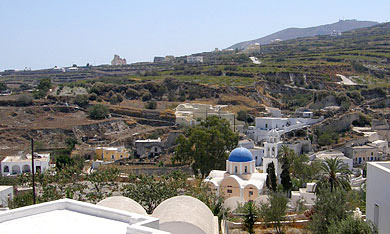 Exo Gonia village is on the way to Kamari, 8 kilometers from Fira in the south eastern region of Santorini. Older maps refer to it as 'Apano Gonia' (Apano Gonia = The Corner Above). High up on the hill one can find the Church of Agios Charalambos, which is one of the three largest churches in Santorini. The beach of Exo Gonia is 2,6 kilometers from the village. It is called Avis beach, after the AVIS Tomato Canning Factory that used to be there. Exomitis (in earlier days it was known as Exemiti) is both a cape and a village on the southern coast of Santorini near to Perissa. The village belongs to the community of Emporio. On the rocks to right hand side of the road from Perissa going towards Exomiti, there are ancient tombs. 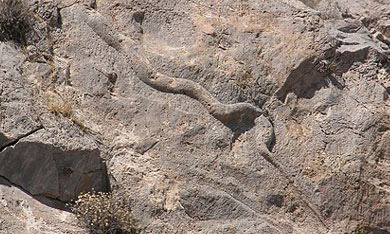 One of the rocks has a carving on the tombstone of a huge viper, the 'Oxentra' or 'Exentra' which is Ancient Greek for 'Oxia" = viper. The port of Ancient Elevsina is thought to be near to the Akrotiri of Exomiti. 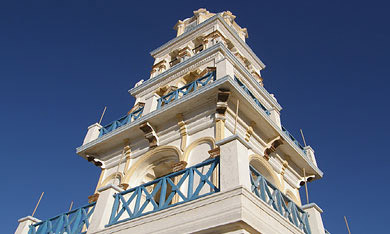 Panagia Kalou is 8 kilometers north east from Fira. 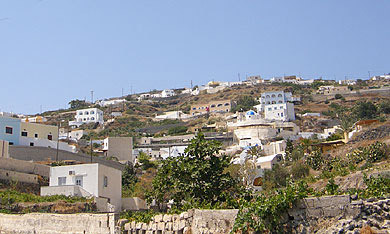 The village belongs to the community of Imerovigli. 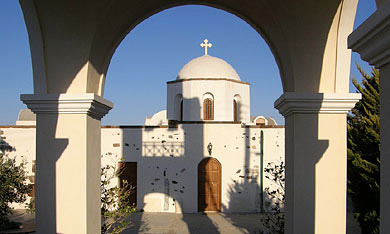 The village takes its name from the Church of Panagia tou Kalou otherwise known as Koimisis of Theotokou. Panagia tou Kalou means Holy Virgin of the Good. The church was built when 'O Kairos tou Kakou' = The Time of Evil was over, in other words the seismic activity during the period of 1649 until 1650. The result of this activity was the appearance of the submarine volcano in Kolumbo. Vothonas village is 3,3 kilometers from Fira, just up and next to Messaria. Vothonas is built within a gorge, while many of the original dwellings are cave houses that have been dug into the volcanic rock. You will find the Church of Panagia of Trypa and the Church of Agia Anna. 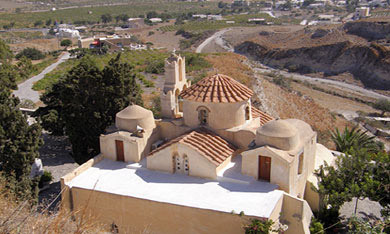 Vourvoulos village is 3,7 kilometers approximately from Fira going north east. Below the village is a majestic view of the eastern plains, the coastline of Santorini, Vourvoulos beach, the northern coastline, and the beaches of Pori and Koloumbo. Vourvoulos means 'fouskala' = bubble or blister, and it is said to have got its name from curious shaping of the terrain in the area, which due to its volcanic origin is geologically pustular. Within the village a monument has been erected to honour those who died in the Secong World War during German occupation. 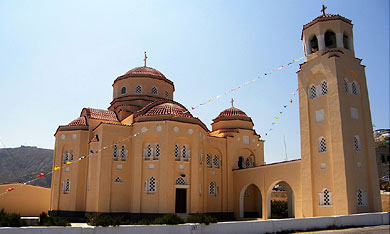 You will also find the Church of Agios Eftstratios and Church of Agios Panteleimonas.